We are still without a decent camera to photograph our meals with, so I figured I would do a thorough clean up of our photo archives and post them here. In our house, garlic reigns. Everything is garlic infused even though the names of the recipe do not always tout it as such. Besides keeping vampires at bay (I’m not kidding!) it also has many other health benefits such as lowering your cholesterol, lowering high blood pressure (great for pregnant women are prone to pre-eclampsia – learned this during my three pregnancies), and lowering blood sugar for diabetics. I don’t know too many people who do not like garlic (because I screen my friends to be on the garlic tolerance scale 🙂 the more they like garlic, the closer they are to my heart). But if you happen to be a garlic newbie and just don’t know what I am talking about you can read more about this stinkin’ rose here or just come over my house and you’ll smell what I mean. Note: in the summer time when we have plenty of fresh herbs, we’ve also chopped up basil, parsley, oregano, or thyme into the rub, just depending on what we’re in the mood for. Hi Mae, no, the cake in the banner is a fudgy choco cake, not sponge. Sorry, I’ve never tried making sponge cake. The fudge cake is very moist though. I’ll have to find the recipe and email it to you. I definitely will. Hey, is that a moist chocolate sponge cake i see on your banner??? Where can i find the recipe, please?????? Hi Mae, Thanks, I hope you do try it. Let me know how it comes out. Love the look of this. I want some. I will make this soon! Hi Shirley,I’m glad you found some inspiration in our recipe 🙂 Your version sounds great, I’ll have to try it next time we make some cornish hens. We tend to use the same lemon/honey marinade for cornish hens. I bet the asian flavors would be a very different change. I had a cornish hen defrosting and came across your blog. I kind of deviated from your recipe but it was sooo good. I used one whole head of garlic, instead of salt I used soy sauce, crushed a few (4)fresh/frozen labuyo peppers, juiced one lime and black pepper…this was all to my taste. I put a whole bunch of the garlic mix into the skin and I baked the hen breast down. I basted it a couple of times. Ohh, the aroma and the taste of all that garlic! The soy gave a nice (not too salty) flavor plus nice coloring. Thanks! 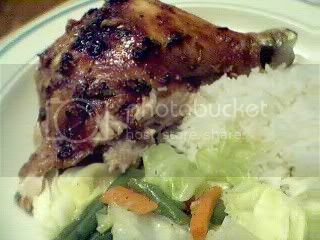 It’s so funny – I posted my garlic chicken recently and you have yours as Garlicky Chicken Bake I love garlic just anything about it and yours really look delicious..
Oh by the way did I ever mention to you that I already add you on my link?